When Kyra Zahn, a fifth-year student at Laurier’s Brantford campus heard about the new Intercultural Certificate program, she knew that she had to enrol. Offered through Laurier International, the Intercultural Certificate program develops new intercultural knowledge, skills and attitudes that stimulate a commitment to lifelong learning and strengthen one’s capacity to become globally engaged and active citizens. After graduation, Zahn hopes to secure a teaching position. As a future educator, Zahn felt that the six 80-minute module program would help her to become a better teacher. Maggie Zhang, a soon-to-be Laurier graduate, also enrolled in the certificate program. As an international student from China, she hoped the certificate program would help her to learn about other cultures, and help her to teach other students about her own culture. Zhang recently completed a four-year degree in Youth and Children’s Studies at Laurier’s Brantford campus. She thought the certificate program was a great way to meet new students, both international and local, and that it provided a safe environment to share her voice. Zhang recalls arriving in Canada and being amazed at how friendly everybody was. She was a little confused by everyone greeting each other with, ‘Hello, how are you?’ In China, it is not common to greet people you do not know, nor is it common to ask someone you don’t know how they are doing. But Zhang quickly learned that Laurier Brantford was her new home away from home, and that the university’s reputation of having a tight-knit community that cares for each other stood to be true. Introduction to concepts of culture. 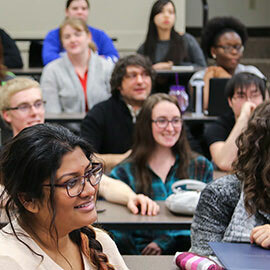 The Intercultural Certificate Program was developed in collaboration with Laurier’s Diversity and Equity Office and the Centre for Teaching Innovation and Excellence and is delivered by staff from the three departments. Laurier International encourages, promotes and seeks opportunities for members of the Laurier community to effectively pursue their interests and careers in a globalized world and enhance their international and intercultural competencies. For more information, or to register for the Intercultural Certificate program, contact globalengagement@wlu.ca.